The scenery of Parliament Hill in the city of Ottawa, Ontario is beautiful at night from Nepean Point as the lights illuminate the entire area. The lights glow across Parliament Hill making this one of the highlights of the city at night and a beautiful place to capture some pictures of these historic buildings. Parliament Hill is an important and symbolic icon for Canadians and is one of the most significant heritage sites throughout Canada which thousands of people come to see every year. In 1976, the Parliament Buildings and the grounds became designated as a National Historic Site and this section seen at night from Nepean Point is known as Centre Block. Picture of the night lights of Parliament Hill in the City of Ottawa, Ontario in Canada as seen from Nepean Point. 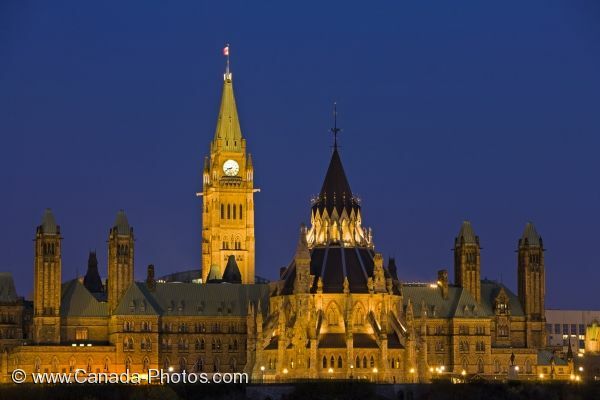 ... Centre Block is home to the Senate, the House of Commons and the Library of Parliament and at night, this section of Parliament Hill is beautiful as the lights enhance the architecture of the building. View of Parliament Hill seen from Nepean Point at night in the city of Ottawa, Ontario, Canada.